ESA Observed Weird Blue Patches On Mars' Surface. What Are These? In this image, released recently by ESA — European Space Agency — we can see a pronounced effect of prevailing wind on the red planet, Mars. Here on Earth, we are quite accustomed to the winds shaping the surroundings environment forming smooth and rippling dunes. The same thing happens on Mars. 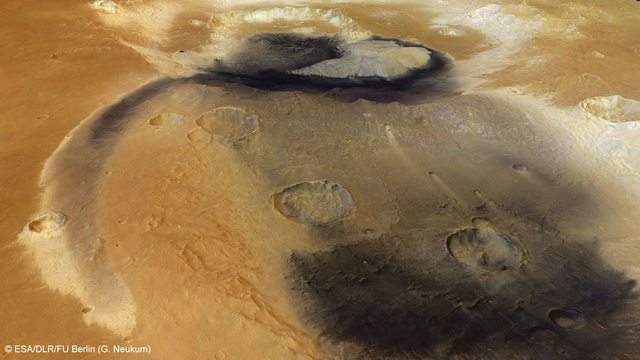 On Mars, winds are very strong traveling at high speed 60 mph (100 km/h), they create giant dust storms and as it moves, small layers of this dark and rich volcanic dust get trapped in the craters pockmarking the landscape. According to the space agency, evidence of these processes can be seen in this photo snapped by Mars Express orbiter on November 19, 2014 ~ which belongs to the ESA. Over time, enough of the darker dust collects on the crater’s surface and appears as the blue patches than can be seen in these images. This photo shows part of the Arabia Terra region, a region scattered with craters. The largest crater in the picture has a diameter of 70 kilometers. At first glance, this image seems to show something amazing in this crater, and in one of its neighbours to the right: is this a hint of blue liquid water? No, it is an optical illusion caused by the image processing. The blue-hued patches lying within the ragged craters are actually dark sediments that have built up over time. Again, this is due to the winds, which carry dark, volcanic, basalt-rich deposits across the planet. Wrote ESA in a new release. Another photo of the dramatic effects on predominant wind on Mars. © ESA/DLR/FU Berlin. Featured image: © ESA / DLR / FU Berlin.